Your business has been up and running for a few years. You worked hard to brand it, build goodwill, and establish a solid reputation. Your trademark – which includes your logo – has been central to that effort. You display it prominently on the company’s website, social media accounts, and labels. Now you discover a competitor is copying it with minor tweaks. The competitor is trading on your business name and reputation. Worse, the competitor is siphoning off your business. Often this scenario plays out because a business has not bothered to protect its Mark. While imitation and copying are a sign of success, they’re also a sign that you need to protect the Mark. Going after a competitor in court should be your last resort, not your first. And in another Trademark Note we’ll talk about how to apply to register your trademark. But here we want to mention steps you can take NOW, with minimal expense, to protect your rights in the Mark. As soon as possible, add your Trademark Notice to your labels, brochures, website, general advertising materials, packaging, and so on. The Notice may take one of several forms, depending on whether or not the Mark is registered at the US Patent and Trademark Office (USPTO). If your Mark is not yet registered, add a little “TM” as a subscript or superscript to your Mark, like this: TRADEMARK™. If you’re selling services, not goods, you may use the “SM”: SERVICESM. Remember though that the “SM” is only for services. If you’re offering both goods and services for sale in commerce, use the “TM”. For example, WINEBAR™. 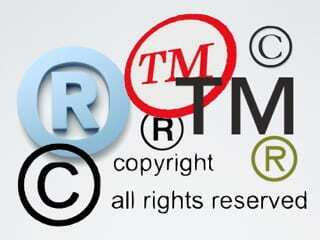 Use the “®” only after your trademark has been officially registered at the USPTO. Use it as a subscript or superscript, for both goods and services: FABULOUSGOODS® and FINESERVICES®. Remember: While your application to register the trademark is pending, you must continue to use either the “TM” or “SM”. If you do not use the appropriate trademark notice, the Mark is essentially up for grabs in the public domain. That makes sense: If you’re not letting the rest of the world know that you claim the Mark as yours, how can you expect competitors to know? That’s what your competitor will say when you ask them to stop copying you. To be sure, trademark law says if you’re the first to use the Mark in commerce, you own it as soon as you begin to use it commercially. But you will have a hard time enforcing your rights in the Mark until you start letting the rest of the world know that you claim ownership rights in it. These rules make some business owners uncomfortable. You spent time and money designing your trademarks, your advertising material, and labels. Now a lawyer advises you to add the appropriate trademark symbol, “TM”, “S”, “M”, or “®”, to all advertising materials and labels. Won’t the symbol degrade the look and appeal of the logo? The label? The website? Your graphics and design team can work with you on this. Graphics and design professionals understand that your trademark is the foundation of your business branding. It’s one of your most valuable assets. In addition, at the bottom of your website pages and advertising materials, and on your packaging, consider adding the following extended Notice: “TRADEMARK” and “LOGO” are the exclusive property of [business name]. Once your Mark is registered tack on to the extended Notice, after the name of your business: “Reg. U.S. Pat. & Tm. Off.” Or you may substitute this Notice: “TRADEMARK” and “LOGO” are Registered, U.S. Patent and Trademark Office and are the exclusive property of [business name].